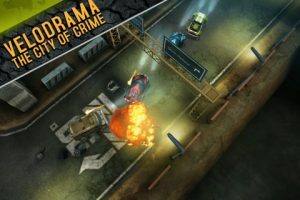 Old school gamers familiar with the classic racing hits Rally X by Namco and RC Pro Am by Rareware will feel right at home with Death Rally by Remedy Entertainment. 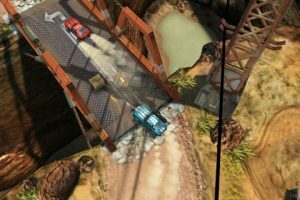 Like those games, Death Rally features an over-the-top view of twisting and turning courses, and like RC Pro Am, the game encourages gamers to rely on vehicular combat and vehicle upgrades in order to get ahead. Though Death Rally suffers slightly from “loose” controls and camera views that don’t always allow the player to anticipate what’s to come, its ample features and scores of tracks and races give gamers plenty of bang for the buck. Remedy Entertainment is known for the popular Max Payne and Alan Wake game franchises. But Death Rally is actually based on a game they developed for MS-DOS back in the mid-1990s. 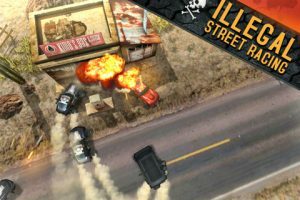 Similar in tone to the Mad Max movies, racers drive souped-up vehicles through junkyards, broken-down industrial zones, and closed-off urban areas. Race modes vary from standard races to one-on-one, destruction rallies, all-nitro races, and dozens more. Players begin with a standard vehicle and are able to upgrade the vehicle via currency earned during the races. Since the on-screen controls are a little sketchy, immediately upgrading your vehicles handling is recommended, even before upgrading other factors like armor, speed, and health. To compensate for the lack of buttons, acceleration is handled automatically and players control steering and shooting. Though this is a nice touch and allows players to keep their minds on the action, the option to add a handbrake would have been nice to make the tight corners a bit more manageable as the “slippery” steering makes navigating these turns more of a challenge than it should be and both of the camera angles offered zoom in a little too close, making last-second turns extremely frustrating. 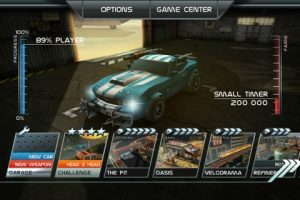 While racing, players can grab items used to upgrade their vehicles and build additional ones. Vehicles vary in speed, handling, and durability in addition to their firepower. Some players may choose to use heavier vehicles to compensate for the controls, while others may go for pure speed. Unfortunately, because of the current lack of multiplayer, you won’t be able to see how your tricked-out power van compares with other players. Remedy’s reputation for strongly cinematic games may not be as evident here as in their grand console titles, yet there are hints of it throughout Death Rally. The camera pans around the action with cinematic flair, and the courses and backgrounds are extremely detailed. Bottom Line: Death Rally‘s loose controls and lack of multiplayer subtract little from its status as solid arcade battle-racer with tons of extras. Death Rally is compatible with iPhone 3GS, iPhone 4, iPod touch (3rd generation), iPod touch (4th generation), and iPad. Requires iOS 3.2 or later.